This is the first game in the Golden Axe series. 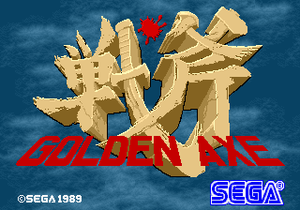 For other games in the series see the Golden Axe category. For the PlayStation 2 remake, see Sega Ages 2500 Series Vol. 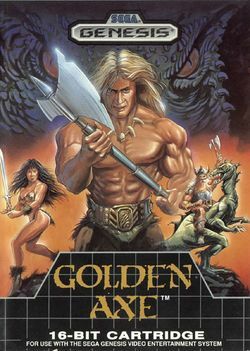 5: Golden Axe. Golden Axe is a side-scrolling arcade beat 'em up released by Sega in 1989. The game has a medieval/fantasy setting and three characters to choose from (Gilius Thunderhead the dwarf, Ax Battler the barbarian, Tyris Flare the amazon). The game set itself apart from other beat-'em-ups (including Sega's popular platformer Altered Beast, released the previous year) by its inclusion of magic powers unique to each character as well as rideable beasts known as Bizarrians, each with special moves of their own. Together, these features made each character play differently, rather than just having visual differences to separate them, and the Bizarrians' differences added another level of depth to the gameplay. The game was epic in every sense of the word: bosses dwarfed the player characters, magic powers filled the screen, and enemies let out shrieks of pain as they died, their corpses permanently littering the playing field rather than vanishing like in most games in the genre. It was a true demonstration of the System 16's power, and the game quickly became one of Sega's biggest sellers. Since Makoto Uchida was the primary developer of both Golden Axe and Altered Beast some stylistic elements have carried across; most notably, the Chicken Legs (which were merely a type of enemy in Altered Beast) became rideable beasts for both players and enemies to use against their foes. Their unique appearance made them an iconic feature of the series: all the games (both sequels and spinoffs) feature them in some role except for Golden Axe III. The game was soon ported to many home systems. None of the home ports quite matched the original's graphics and sound capabilities, but they received several additions that made up for these shortcomings. Most home conversions include the new The Duel mode, a frantic brawl on a fixed screen with increasingly difficult enemies but no healing or magic, as well as two extra levels. The game's lasting legacy led it to spawn four sequels, three spinoffs, a novel, and two six-part comics in the fortnightly Sonic the Comic. More recently there has been a PlayStation 2 remake (Sega Ages 2500 Series Vol. 5: Golden Axe), and Golden Axe: Beast Rider, a reboot of the series, has been released for the Xbox 360 and PlayStation 3. Golden Axe is still widely available; the Sega Genesis version is available via GameTap and the Wii Virtual Console as well as in the Sega Smash Pack (Game Boy Advance) and the Sega Genesis Collection. GameTap also offers the arcade version. It is also available as a digital purchase for the Xbox 360 and PlayStation 3, complete with achievements and trophies and online co-op. The land of Yuria is in danger. The evil Death Adder has found the Golden Axe, a magical emblem of the land, and has used its power to capture the royal family and overthrow the land. Each of the heroes has lost a relative to Death Adder; as they begin their journey to avenge their dead a friend, Alex, stumbles bleeding onto the screen, explains what has happened, and is killed by one of Death Adder's henchmen (in most ports this scene is instead depicted through dialogue). Golden Axe has been released on many different systems and has accumulated a wide range of box artwork, some of which is displayed below. This page was last edited on 4 July 2016, at 13:24. This page has been accessed 77,398 times.